Trusted games dealer AntOnline via eBay Daily Deals is offering some nice deals on PS4 DualShock 4 controllers today. 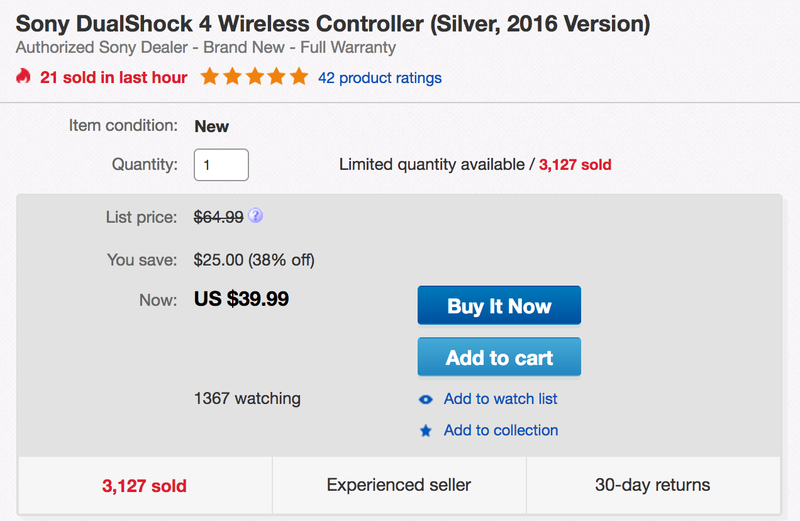 Both the black and silver, 2016 model DualShock 4s are available for $39.99 shipped each. That’s matching the lowest price we have seen on the silver model. It has never dropped below $48 on Amazon. The black model dropped below $40 a few times over the holidays, but most deals keep it at around $40. Both colors are at the current lowest price we can find in today’s deals and go for $45 and $50 at Amazon respectively. More details below. You’ll find all of the best deals across every platform everyday of the week in our Games/Apps Guide. The DualShock 4 Wireless Controller features familiar controls, and incorporates several innovative features to usher in a new era of interactive experiences. Its definitive analog sticks and trigger buttons have been improved for greater feel and sensitivity. A multi-touch, clickable touch pad expands gameplay possibilities, while the incorporated light bar in conjunction with the PlayStation Camera allows for easy player identification and screen adjustment when playing with friends in the same room. The addition of the Share button makes utilizing the social capabilities of the PlayStation 4 as easy as the push of a button. The DualShock 4 Wireless Controller is more than a controller; it’s your physical connection to a new era of gaming.